Here it is! Above is a photo of the finished machine (click here for more photos). Last night, I mounted it on an old kitchen cabinet that I put on small wheels. 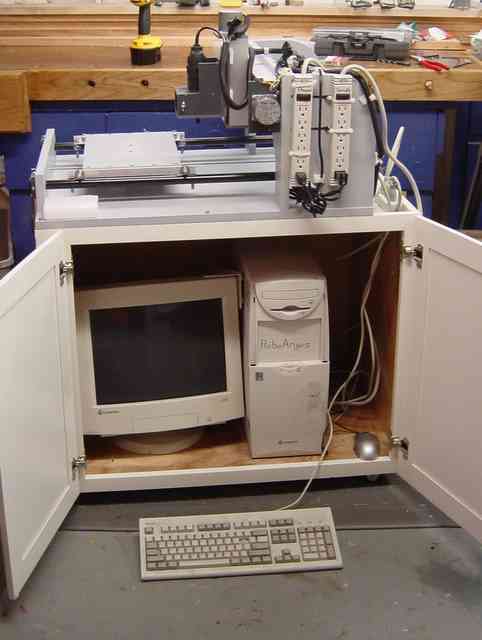 The PC that drives the machine resides inside of the cabinet. Makes a nice portable setup. I powered the machine up and configured the software. Everything runs great under “jog” control from the PC. I began to test a g-code file and got mixed results. I am clearly making some kind of error in my g-code files, so I need to do a little more research on that issue before the machine real cranks up. Posted on November 11, 2005, in CNC. Bookmark the permalink. Comments Off on 7th Powers Up!.